As we mentioned in PART 1 of this article, scribbling is one of the first steps your little one takes to understand writing and language. What started as random whole-arm movements has turned into fine traces of shapes and objects. At around 34 months your daughter will start holding the crayon or marker in a more mature way, finding her pencil grip for writing. 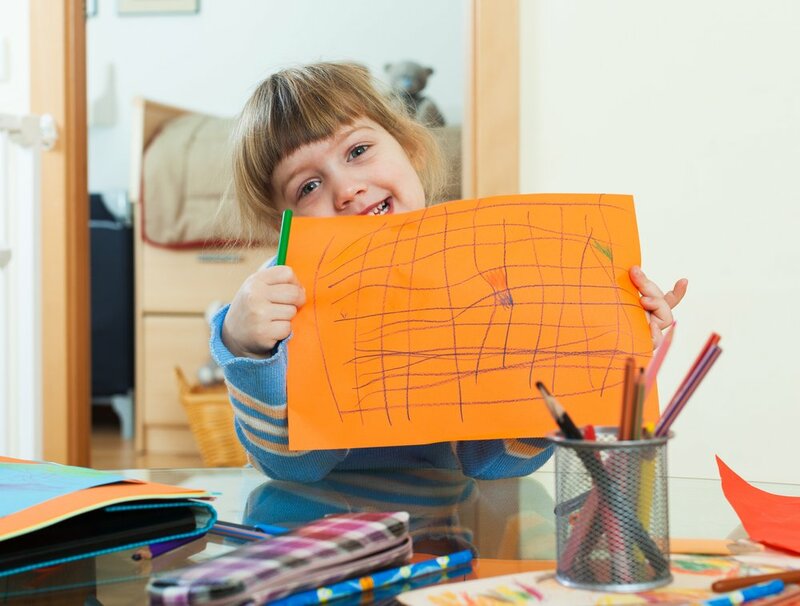 She’ll start planning beforehand what she wants to create in her drawings, and she’ll love copying and tracing shapes using different art materials and specific colors. As she broadens her repertoire of experiences, she’ll start learning more about the specific parts of written language. Now that she has her writing grip down, your little one will love putting it to practice. You’ll see she has a good posture when drawing and how this affects the flow and pace of her scribbling. A lot of her drawings might consist of circles during this age. At first you might see irregular circles and lines on every direction, but as she practices her wrist and small finger movements, you’ll see a beautiful picture of the sun shining on her paper. At this stage she’ll love to incorporate other kinds of materials to her drawings. Playdough, paper strips, and paint are great for this. As she holds the marker, rolls the playdough, and pastes paper strips, you’ll see her go from broad and controlled wrist movements to delicate actions done with her fingers. She’ll gain more strength on her muscles and control over the pressure she applies on the crayon. She’ll eventually go from shapes to more complex objects. Remember that everything is linked. Since your little is now the conversationalist, she’ll want to explain more of what’s behind her drawings; her abstract thinking skills are also playing an important role at this stage. She’ll be more interested in complex shapes, like squares; she’ll start giving meaning to the lines on the paper and learn how they can represent something else, like a house. This is an important milestone since your child will begin naming all of her lines and marks and understand that real objects can be symbolized by them. Since by now she also understands the function of different body parts, she’ll be interested in drawing persons and telling stories about them. You’ll see that her fine motor skills start reflecting on her self-care skills as well. Her precise movements, muscle strength, and finger division will lead to the manipulation buttons and soon shoelaces. Her skills will develop enough for her to begin to understand the difference between pictures and writing. She’ll go from random scribbles to experimenting with letters. At first, she’ll make up some of her own because letters look like the shapes she’s familiar with, but eventually she’ll learn to write her own name. Research shows that children around 3-4 years old start acquiring name-writing skills. These will not only serve as an important part of her literacy development, but also for her use of oral and written language. From random to controlled movements, every scribble your little one makes will foster her fine motor development and her reading and writing readiness for the years to come. Check out this article to learn more about your little one’s pencil grip.